Thank you all who meandered over to my store at TopatoCo. I appreciate the support from you all, the readers of Spacetrawler. Truly, thank you. All is well here. Started writing a novella this week. That was unexpected. But mostly I’m just trying to keep up on all my projects and exceed my own writing and drawing expectations for them, as well as provide emotional support for my girlfriend who’s a few weeks from finishing Grad school. Overall, my head has been a bit fuzzy between the ears when I look up from my desk. A bit punchy. 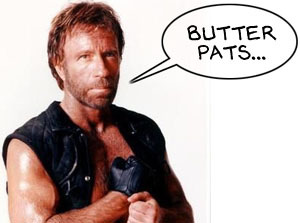 In case any of you had difficulty imaging Chuck Norris threatening you by saying, “butter pats,” here you go. Lastly, I thought I’d talk about the whole death thing briefly. First off, for anyone wondering: Flineous is dead. Just like Growp is dead, and Dal. This is no Baloo the bear situation. If I go down some road later which brings characters back to life in some sci-fi way, that’s something else entirely. But he’s dead. If you need a moral: torturing people is not cool, and you may face retribution. Why kill characters? It seems somewhat taboo to do so, possibly because of our culture demanding writers to leave avenues open for writing sequels. But I wrote it this way because it was how I thought the story should be written. It’s a complex story, and I feel these deaths both define the world they are in as well as who they are as people. And also, know that I don’t take any of these deaths lightly, even if it seems frivolous. When it gets made into an awesome SciFi channel series, they can have the characters live in that version as long as they want. Now, more importantly, it’s time for a cup of hot chocolate. Power Switch – nicely done! Mr Hastings! And – my body is a weapon – eek! And death – yes, you need death to give life value – Tarol Hunt does this well on Goblins … Thumbs up from me. Oh … wow. Awesome strip today! OH NO – not in my brian! It was a fast merciful death. Eris this species has a little creature attached to their brain that does all the high-level thinking. This particular one is named Brian. Hopefully she opts for something in a slightly more human mode. Winning a war is all well and good, especially when it’s for a good cause, but it’s nice to have some humanity to come back to at the end of the day. So should we start talking about how thus ends “The Life of Brian”? So… turns out the fight was a teensy bit unfair after all. it didn’t end in amputation!! aside from his blood vessels that is..
Yuri is only partially Eeb, and she can kill somebody very quickly with just her mind. She can actually see blood vessels in somebody’s brain. Okay, now … let’s consider the fact that there are a lot of unclamped Eebs out there. A LOT of them. All inside spacetrawlers. And let’s say that somehow a mental message got out to them to kill everybody on board their ship. Ah ha ha, I wondered how Yuri would pull this of with her new laser-limbs being sliced off all willy-nilly. This may sound in poor taste, but panels 11 and 12 (the twist and the death scene) kind of make me laugh in a dark-humor way. Nice writing there! A shame Flineous wasn’t a weasel. “And now I will pop them.” Jeez! If he wasn’t a horribly murderous torturer, I think I’d feel sorry for the guy. Chris, the best way to support a lady finishing grad school, is chocolate (Godiva, the good stuff), scented baths if she likes those, and foot rubs – lots of foot rubs. Also, tell her she’s pretty, a lot. The last part of grad school takes a toll on the ego. Keep her long on hugs and short on drama. I was hoping this would end in a way that would show that Yuri’s condition has improved. Something along the lines of her scaring the crap out of Flineous but then just putting him in a safe cell deep in the ship’s belly. She controls the entire ship remotely with her mind, remember, so even with her limbs laser-whipped off she could just have pinned him down by increasing gravity 10x right under him. Instead she seems more psychopathic than ever now. A revenge killing is not normally prescribed as part of the healing process after severe trauma. Come to think of it, the trauma of being tortured might not even be the main problem she has. She has part of an Eeb brain implanted. And Eebs are … not quite normal. Not so good. I just realized the only person capable of fighting an unclamped Eeb is an insane human cyborg. Oh dear. Just curious, Chris. Was the Yuri arc planned from the very beginning of the strip, or did you come up with it later? Yuri’s face when she says “And now I will pop them.” — brrrrrrrrrrr. P von S: Yuri’s still insane, but I think it’s a different kind of insane. She’s putting more thought into things, and her actions are more deliberate than last time. See, now you’ve gone and made me all sad. My puny human mind doesn’t remember him being a sadistic imbecile! Poor kitty. Ah yes, I’d forgotten that little ramification. With a little a little psychic shrug, yuri can just think someone to death. She’d better keep that ability secret, just in case she needs it again. And maybe that part of the many reasons why she was laughing. You know, aside from trauma, catharsis, butter pats and the rest of it. She saw that Flineous was utterly true to his nature. He sadistically whipped her limbs off instead of just killing her quickly by whipping her head off. If he’d just done that, maybe she wouldn’t have been able to psychically give him a fatal, huge stroke. Although I wonder how long it would before her head would lose consciousness after beheading–but never mind. And sorry Chris, I really am, but that image of Chuck saying “Butter pats” still makes me laugh hysterically, can’t help it. Not to negatively criticize, for I’m okay with it, but I think with the “comicky” style it’s easy for readers to forget the mature nature of the story and this comes as a whiplash. I’m curious about this novella, btw. In one strip you show why brainclamping is a necessary evil. I hope the G.O.B. wins the war. Okay, Chuck Norris made up for it, but still. @Eris: You forget they experience constant pain every time they so much as think of anything that doesn’t synthesize what their masters want. @Coyote: Oh, “pop goes the weasel”. Hardy har. @Corpore, Ah yes, I’d forgotten that little ramification. With a little a little psychic shrug, yuri can just think someone to death. She’d better keep that ability secret, just in case she needs it again. Having been through grad school with very little partner-help, I would suggest laundry and decent food as being WAAAAY more desirable than chocolates and compliments. This of course assumes that you are not equally busy, or are willing to be busier for those few very stressful weeks. Seriously, I went out and bought more underwear because I figured it was faster than doing laundry. Not quite an Usagi “skull of death,” but fairly close. Good strip. Book 2 will be great! @TB, the funny thing is that as i drew it I realized it was inspired by “Groo the Wanderer” by Sergio Aragones and Mark Evanier, which Stan Sakai used to letter before he began publishing Usagi Yojimbo (where he as well utilized the device). Hey, good job on making Flineous continue chopping Yuris limbs. It would have been confusing for him to start getting inaccurate or clumsy because he chopped her first couple of limbs lightning fast, a fair fight that way could have been stupid and overused BUT also this kind of ending is also a bit anti-climatic – maybe I just am conditioned for big fights. I do actually like the idea he is dead, it will give room for fresh characters (read enemies :3), after all, Flineous wasn’t really that charming being the bad guy. I also love this episode of Dimitri and Yuri being so dark, even though Yuri’s already murderous, it will deepen her character as well as Dimitri’s. @Jonesy, the nimble female has just shown you her badassity certificate, and you’re complaining? So does keeping your tail wrapped around an ankle keep it from being scorched in the jetpack exaust? Good to know if I am ever in that situation. I recall Youri fainting after moving something heavy with telikinesis, so her ebb brain is clamped still. I suppose it could be purely human vindictiveness that makes Yuri happy to defeat an enemy so thouroughly. It’s true that some Earth cats really like licking butter sticks but some just don’t care–they’re picky and weird that way. And even though Flineous looks catlike, that doesn’t mean he’s anything like Earth cats. He’s alien first, catlike second. Yeah, see, if only Flineous brandished the whip and taunted with, “…With this I’ll slice you up like a hock of furryite!” *That* would have been a frightening image. But nope, he went with “butter pats.” That doesn’t make me think of microtoming and cauterizing muscle tissue, or bloody murder, that makes me think of waffles. My brain just laughs at weird juxtapositions in grave, scary situations. I don’t know why. That’s it. I will not broach the subject again. Back on the to Yuri’s state of mind. I think it’s completely unclear at this point how much of her behavior is due to the Eeb parts of her brain seeking revenge or just her entirely human reaction to torture and assault. Post-traumatic stress makes people do weird things. As revenge it wasn’t a awful as it could have been. She scared him a bit, chased him around a little and then, with the last word, killed him very quickly and probably with little pain. The earlier strips showed us that he wasn’t going to go away. She would have had to face him at some point. So as confrontation, victory and revenge I suppose it’s a start to healing, but I don’t think she’s out of the woods yet. I think it’s still too early to say if she’s still loony or she’s just angry and scared. I’m okay with this Yuri. I might not have let him whip me and laughed quite as long though. I tend to think killing should be done quick and move on. It seems safer that way to me, and I leave retribution to God. But protect myself in self defense? Definately. Yuri’s way seems a bit wasteful of effort, and not even particularly revenge minded. But then, she has more resources available to her than I will ever have. I look forward to what she comes up with next. Okay, tremendously cool that Yuri has some Eeb brain in her makeup now, but that raises a lot more questions. When did she get it? I know the Eebs have been helping to rebuild her (with a wide variety of shapes and abilities), but I don’t remember any Eeb ever mentioning that they were giving her Eeb powers. How much Eeb brain does Yuri have now? And where did it come from? One of the Eebs rebuilding her? A dead Eeb? The Spacetrawler? Does Yuri’s implanted piece of Eeb brain come with more than skills? Like memories or emotions? (Which would help explain why once-mild-mannered Yuri is such a psychopath now. I mean, I understand her desire for revenge against Flineous, but she was just as crazed during earlier battles.) And regardless of how much Eeb brain Yuri has or where it came from, I seriously doubt she’s “clamped” in even the smallest degree. Are the Eebs using Yuri as an additional courier to transport their unclamped DNA? So many questions! And I must wait for the answers as the strip continues to unfold! Aaugh!!! Why does Yuri’s hair hang down by her face even when she is upside down? I know she turned the gravity off, but I would have expected the hair to spread out around her head, kind of like a halo. Also. I’m sorry Growp is dead–I miss him. Evil as he was, he had some redeeming virtues. The part I missed , was where Flineous knew before this strip that Youi had implanted some Eeb grey matter. If Flineous forgot this, I forgot when he would have known it before this. Yuri is an interesting Chemera, she could build herself into the ship, she could releive the space trawler from its pain and incorporate it into herself, she could controll several robotic bodys by radio links , she could be the origional Borg. Or she could meet a really nice engineer that appealed to her and who owned a can opener. Okay. Strips 66 and 67 are clearly when Yuri acquired some Mauve12, which she mentioned in strip 71 (and Barbot/Therapybot in 170). But I totally missed the significance of her fainting in strip 79, and had no clue it was related to clamping at all. 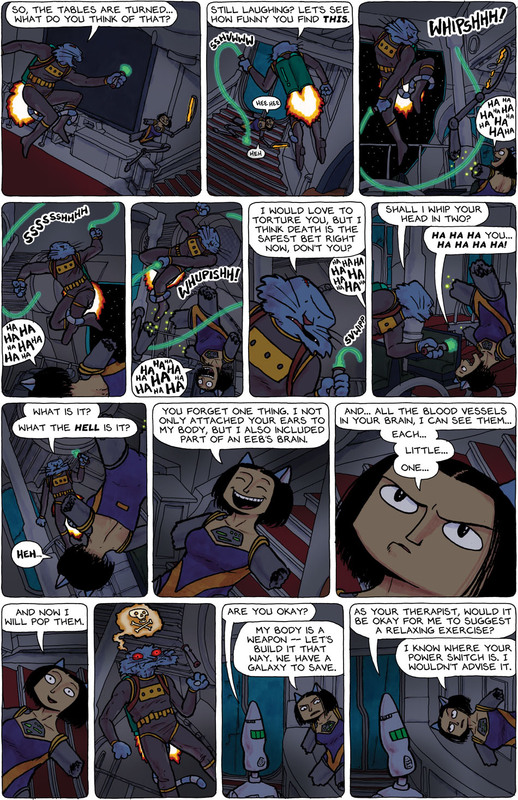 The Eebs kept adding to Yuri’s cyborg enhancements from strips 95 (“Eebs! You have five minutes to trick me out to battle a small army!”) to 99 (“Yes, your lasers fuel my power cell!”) to 105 (“I’ll get ’em.” *FWOOM* “Did you just… kill them all?”) to 126 (“Memento wasn’t as good the second time.”) to 132 (“Yuri, grapefruit?”) to 143b (“Great shot, Yuri. That was one in a million.”). By the time Martina decided to dial Yuri back and assign her to therapy (156), Martina believed Yuri’s new emotional state was the sole result of her torture and amputations. I don’t think Martina knows Yuri has gained Eeb telekinetic powers. I don’t think Flineous knew it either. Hell, I don’t think anyone else realizes it, except maybe Cerise22. Are Eebs still helping Yuri with cyborg mods, like the triple-jointed limbs she suddenly sported before Flineous cut them off in strip 188? Or is she now quietly making her own mods? BTW, I love that Yuri came out armed with laserblades. I was expecting Yuri to trap Flineous in a room with the hacked off limbs, which would then explode. Totally forgot about the eeb brain thing, so I’m not surprised Flineous did, either. Popping is so gross and wicked sounding. It was certainly appropriate. Instead of the skull and crossbones, perhaps Flineous should have a pat of melted butter above his head. I can’t stop laughing at the Chuck Norris thing. It might be hard to make, because of using Chuck’s image, but that would be an awesome t-shirt. I think it’s right that a couple of bad guys died. Time for fresh.. nemesises (?) nemesi (?) Evil doers!! Our heroes are becoming battle hardened. A good thing, because at some point, they will be needed to accomplish the purposes (purposi? haha) for which they were abducted in the first place. Also, due to the alphabeticalizing of the tags Yuri is the Omega. Christopher – re the Usagi skull of death: Maybe it’s time to letter Yuri in lower case?